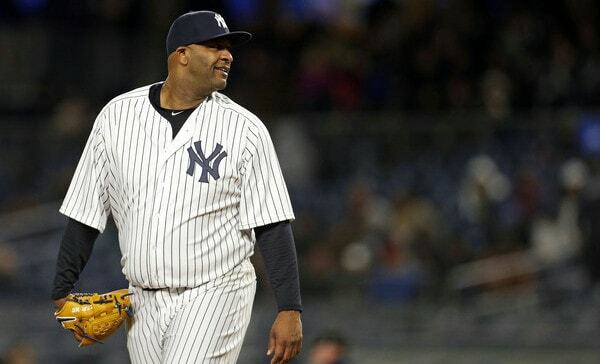 For the second time in as many years, CC Sabathia is about to be a free agent. For the second time in as many years, I expect the Yankees will sign him to be part of the back end of their rotation by about mid-December. And despite what CC himself said on the most recent episode of R2C2 about this being the first time he’s nervous about returning to the Yankees, I think he expects to be back with the Bombers, too. I’m not the only one to say this, but at this point, CC has earned the Andy Pettitte treatment–one year deals till he’s done (which will be after 2019, per that same R2C2 episode). You could probably do worse for a fifth starter than a borderline Hall of Famer who just threw 153 innings, whose ERA didn’t pass anything higher than 3.80 after his second start. Add on the fact that he’s incredibly respected in the clubhouse and helps set the tone for the team and this really does seem like a no brainer. But that doesn’t mean there aren’t concerns. Though he seems to have gotten used to it–Pettitte-esque, really–CC is still pitching with diminished stuff and on a bad knee. He’s certainly managed well the last two seasons, but how long can that really be counted on? He’s an older pitcher and despite how good he says his arm itself feels, the ball and his knee may not agree. There’s also the matter of the length CC can provide. From the ASB on, he completed six innings just four times. Granted, he was cruising in his last start before getting ejected while defending Austin Romine and likely would’ve gone seven to secure his $500,000 bonus. While we shouldn’t take any absolute positions in baseball, it’s likely time to start planning for CC’s starts as a sort of special event. I highly doubt that CC wants–or that the Yankees would approach him about doing–an opener type scenario, but there is something to be said for it with him. Perhaps having a hard thrower get through the first six batters or so before bringing in CC for a change of pace would be good for him and set him up for success in a ‘bulk’ role, throwing 3-5 innings after the opener. Alternatively, which I think would be more amenable to CC, he could be a (mostly) strictly two times through the lineup kind of guy. Ideally, that’s 18 outs, though more likely to be 15-16, depending on pitch count, hits, runs, etc. At most, I think we should expect CC to be a five-and-fly type pitcher, especially given how good the Yankees have been and are at building a good bullpen. The trick is that if the Yankees are going to use this tactic, their other starters must be able to go deep into games, too. Failing that, they’ll need at least two relievers who can go multiple innings. Given the time they have to plan for this strategy, they should be able to do this. While this would be a very different role for Sabathia than he’s been used to, it’s something that could maximize his value in his final year and help the Yankees win; that’s what both parties want, right?